This is not a formal planning document. It follows on from a public consultation in 2016 and sets out the aspirations of the Parish Council for the Farnhams. Please see the link below for a copy of the Parish Plan. The Parish Council discusses planning matters at its monthly meetings and if there is something that you would like to bring to the PC’s attention, the meetings are a good place to do this. You can find out out more about planning issues at the Planning Portal. For information about alterations that you can make to your property without planning permission, termed permitted development and general guidance from the Government – click here. For information about the District Councils’ planning policies and planning guidance, click here. The South Bucks District Local Plan was adopted on 22nd March 1999 as a statutory plan for the District. Following a Direction from the Secretary of State, 75 policies in the South Bucks Local Plan are saved for continued use, and 45 policies are not saved and have therefore expired. In many cases policies have expired because they either largely repeat, or are inconsistent with, national or regional policy. You can find out more about the SBDC Local Plan here. Click here for the consolidated version of the Local Plan, showing all saved policies with expired polices struck through. In accordance with new system introduced by the Planning and Compulsory Purchase Act, and supplemented by government guidance the Council is preparing a Local Development Framework to replace the Local Plan for South Bucks. There are many useful links on the South Bucks District Council website. Environment pages tell you about general planning and sustainability issues. Click here to report a general highway issue, that is not a pothole, broken streetlight or problem with a public right of way. They will ask you what the problem is and where it is roughly? The SBDC website planning applications pages gives access to detail about all planning applications in the district. The Parish Council is a statutory consultee on applications within its boundaries. If you wish to enquire as to the Parish Council’s response on any application please contact the Clerk. The way that SBDC handle the applications via the public access database means that we cannot at the moment offer a direct link to each of the applications. 1. 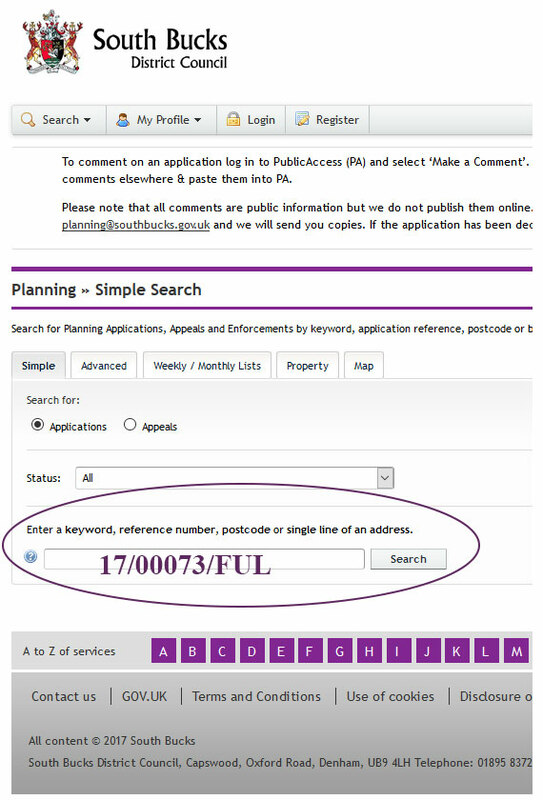 Copy the Planning Reference Number using the Copy command. (Ctrl+C) for the application that you wish to look at copy.